The J7000A Series instruments high crest factor output is used as a random jitter source for serial data bus applications, including PCI Express Gen I & II, Serial ATA, and Fiber Channel. The noise source is designed for the PCI-SIG total jitter (Tj) model serial data application, but can be used for any random jitter noise application. The random nature of this output is designed to model real world electrical noise commonly found in digital electrical circuits. 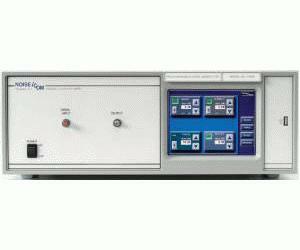 The summing input can control signal-to-noise (SNR) or carrier-to-noise (CNR) for bit-error-ratio (BER) testing similar to other Noise Com instruments. The signal path has a nominal insertion gain of 0 dB, with very low amplitude and phase ripple. Standard units can be modified for specific customer requirements. Please consult the factory for pricing and availability of these requests.